Packaging Machine Productivity? Of Course - But Not At The Expense Of Safety! The packaging industry has a conflict between productivity and costs. Operators need easy processes for changing materials in the input magazine, but their safety must not lose out. It's the ideal working environment for the TÜV-certified Safeguard Detector safety system from Sick. With packaging machines, there is a danger of the operator reaching through the empty magazine and into the machine while it is running, particularly when it comes to material transportation (e.g. flat carton blanks). The traditional solution is to use mechanical tunnel systems with matching covers, or positioning magazines so they are almost out of reach to guarantee the necessary safety. Should the operator need to access the machine, this is exactly where problems arise. After all, covers make it difficult to access components and this takes up just as much time as loading difficult-to-access material magazines. 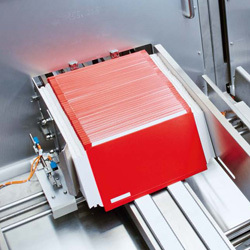 In open systems, the packaging material in the conveyor magazine acts as a physical guard. If there is sufficient material in the magazine, it isn't possible to reach into the mechanics while the machine is running. However, this protection ceases to function when there is no material left in the magazine. The TÜV-certified Safeguard Detector safety system is the ideal solution for your productivity and safety. It doesn't require any covers, but still adheres to any protection requirements – even if the conveyor magazine is empty. Distances from hazardous points and, as a result, the space needed for the machine itself remain small and the magazine is easier for the machine operator to load. If you would like more information about the Sick Safeguard Detector or would like to discuss your specific packaging machinery application, please call 01254 685900 and speak to a Technical Support Engineer or your FIeld Sales Engineer. We already have a number of customers who have installed and implemented this technology and we'll be happy to answer your questions.